While many students incorporate film and digital elements into their displays the six students in the Time-based Art and Digital Film category have chosen to make this medium the primary focus of their creative work. Laura Cesa’s multi-media installation addresses the issue of her racial identity. 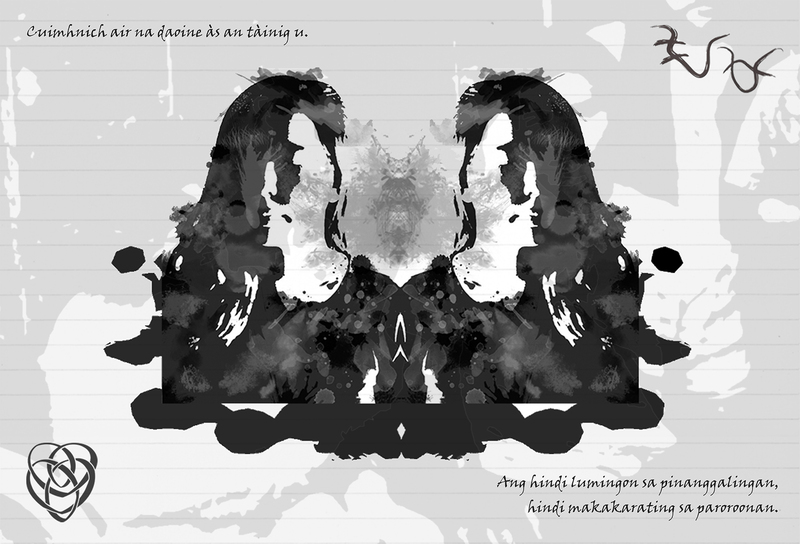 Cesa is part Scots andpart Filipino, and in her companion book, Being Grey in a Black and White World, she states “It’s hard being neither and both all at once.” Her exhibit consists of two short digital films and a series of transparent Rorschach ink blot panels, mounted in triplicate. The individual panels represent layers of her identity, yet, rather like the soundtrack which combines Celtic with presumably traditional Filipino music, Cesa’s work left me with a joyful sense of cohesion as well as a question. Viewing the exhibits from the front flattens the layers into a whole. Is this how Cesa sees herself or is it how we see her? Holly McKee’s film, Elizabeth, Izzy, Betty and Eliza, dramatizes a condition called Dissociative Identity Disorder. We follow a single character, Elizabeth, who wakes up each morning believing that she is living in a different era. In her statement, McKee says: “By altering her voice, her appearance and her personality we eagerly follow her [Elizabeth] through the 1920’s, 1950’s, 1980’s and current day.” Whilst the idea is intriguing, the sound quality as presented in the exhibition space made it difficult to discern the changes in the character’s voice, and for me, the slow pace of the film made it less effective than it could have been. 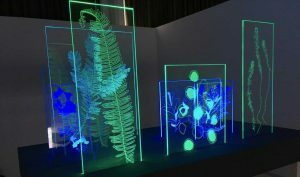 In 2005, Janine Getty scattered her mother’s ashes near Loch Katrine, and her exhibit celebrates “the spirituality that a place may possess once a loved one passes and the abundance of life that is left in the wake of loss.” Getty’s installation consists of eight lazer-cut Perspex panels featuring images of ferns, seeds, shoots and leaves. The panels illuminate in turn then light up together, against a soundtrack of chirruping birds. The work invites you to linger and reflect on the process of regeneration and transformation which occurs in nature. Nature also influences Sarah Pope, who uses an immersive installation of humanesque tree sculptures to represent the seven deadly sins. Pope says: “I want to take this widely known religious topic back to its original [secular] roots.” Pope uses cardboard and tile grout to simulate textures of tree bark. 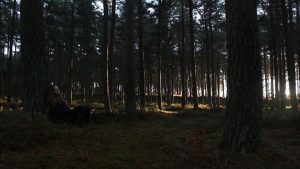 Her concept books are filled with photographs taken in woodlands and include interesting details on the earthly associations of the seven deadly sins. 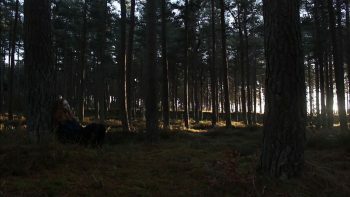 The accompanying soundtrack fuses eerie woodland sounds and voices, adding an extra intriguing dimension to the work. Emma Dempsey’s short film, Tiny Books, explores the internal dialogues we have about the positives and negatives of life. Dempsey’s Lola is a final year student considering her future, battling self-doubt alongside her optimistic sensibilities. The film is well executed: locations and shot sizes vary, shallow focus is used effectively but not overdone and the lighting shifts from high key to low key and all shades in between. Dempsey’s decision to cast two actors may have been influenced by practicalities and works well, but I wonder if this film would have been even more effective with just one actor taking both parts. India Moorjani’s series of short films documents her struggle with mental health issues over a six-month period. Her work is honest, personal and introspective, the gentle delivery style immersive and inviting. Moorjani has provided individual “head spaces” in which to watch the films and the intimacy of these spaces heightens the impression that the filmmaker has singled you out to listen to her story. Well shot and edited, we almost don’t need Moorjani to tell us that her favourite place is home. It shows, and it’s beautiful. An excellent taster highlighting the work of each of these aspiring young artists. It definitely makes a visit to the exhibition a must.